In the celebrity world, you’d have to be living under a rock not to notice that we’re in the thick of award season. Since the Golden Globes took place in early January, Hollywood’s buzziest names have stepped out for event after event and, predictably, everyone has been chattering on about the same usual suspects. Today, though, I’d like to direct your attention to a celebrity who’s been acing award season fashion this year and, in my opinion, not getting the credit she deserves. Glenn Close is the 71-year-old actress making the rounds on the award show circuit for her 2017 movie The Wife. Just like most of the wiser women whose style we stan, Close has nailed down a uniform that works for her—a series of strong power suits—and really crystallized the look as her signature. I really began to take notice of her winning style at the SAG Awards when she arrived on the red carpet in a crisp ivory double-breasted blazer, wide-leg trousers, and a statement collar necklace, a look that’s utterly sophisticated but also feels really fresh. As if that weren’t reason enough to get me talking, the actress followed up with a series of suits, some of printed taffeta, some of soft lilac, and that’s when I realized it’s Glenn Close’s world, and we’re all just living in it. Well, enough of my thoughts on the matter. 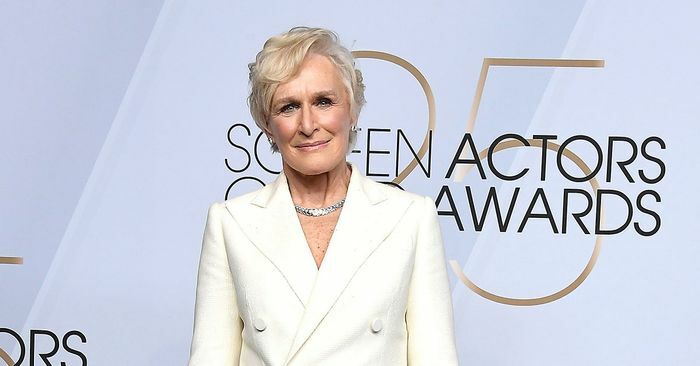 Keep scrolling to get your fill of Glenn Close’s excellent red carpet ensembles, and then shop suiting inspired by the actress’s 2019 looks.